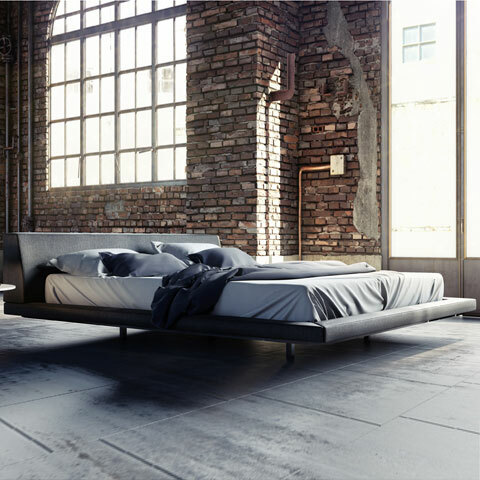 Urban style is personified by the modern Jane Bed. Boasting a low-profile frame, Jane is crafted with a steel frame, then cushioned and upholstered in a contemporary charcoal or moon beam tweed. Nestle your mattress onto the included solid pine slat base, and the Jane Bed offers you a cool and calm respite floating away from the hustle and bustle of your hectic day. Platform height measures 11" high with a 3" inset. Upholstery is a 95% / 5% polyester and linen blend designed for life! Mattress and bedding not included. With Jane's bold lines it's no wonder it made our list of best modern platform beds!